Toby Jones Fishing: Welcome back... It's 2011! It seems I took a little break from fishing around the holidays... In fact, until this past week, it had been almost 3 weeks since I last wet a line. 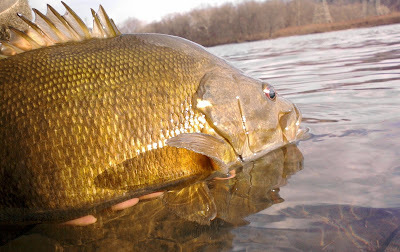 Fortunately, however, I was able to get out this past week--with hopes of bringing in the first fish of 2011, and also soaking in a little bit of "river therapy" to ease the mind and wash away the stresses of the holiday season. I had Tuesday and Wednesday off work this past week, and it only seemed fitting that the first trip of the year would be with my Dad. So when Tu esday rolled around we decided to hit the river, and as luck would have it... We did get those first fish of the new year! 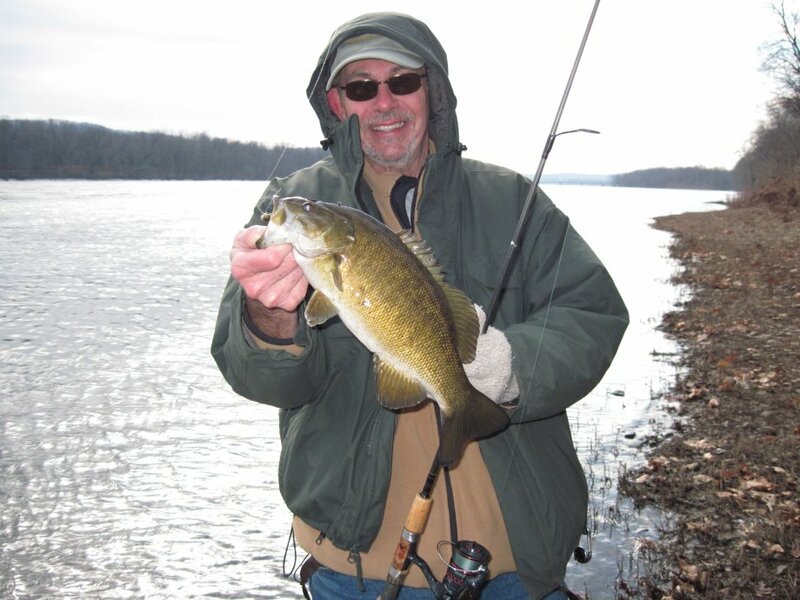 The morning was cold and blustery (and our fingers were frozen), but fortunately the good Lord smiled on us, and we were able to find a few Susquehanna smallmouth who were willing to come out and play. The action wasn't fast and furious by any means, but by mid-afternoon we had totaled 11 bass between us. Most were small, in the 11 to 13 inch range... But we did get into couple nice ones--the largest being a nice 18 incher caught by yours truly... :) All fish came on jigs with soft plastics, and you really had to work the areas hard to get a bite. I also fished a little bit on Wednesday afternoon. Since I had caught a good number of bass the previous day, I decided to fish larger lures and focus a little bit more on muskies. 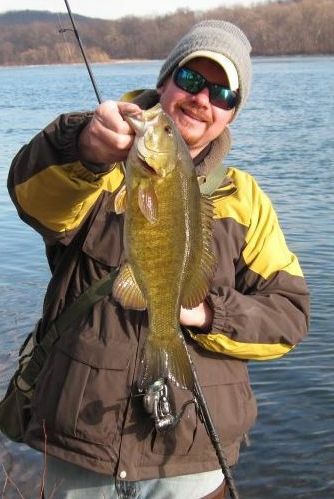 As luck would have it, I didn't put any toothy critters on the bank Wednesday... but I did catch a nice, football-shaped smallmouth. In closing, I just wanted to state a reminder that as of January 1st smallmouth bass are now catch and release only in lower parts of the Juniata and Susquehanna Rivers... So if you are planning to do some bass fishing this coming year, definitely check out the regulations for the areas you intend to fish. But for now, I am just happy to have spent some time on the water this past week. Even though the conditions were cold, the time spent on the water was therapeutic in many ways. It is also always a good thing to get those first few fish of the new year in as well, and we were fortunate to do so this past week. So until next time, thanks for reading and best of luck to you when you get out there on the water.